Welcome to Glissando, Boston’s newest concert series! 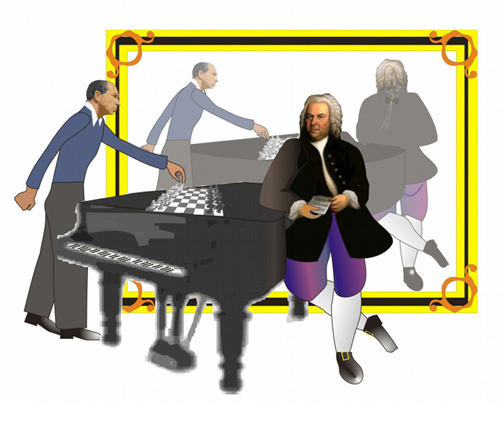 Its 2018–19 season celebrates Bach’s 333rd and 334th birthdays. The seven events of the season are held at the First Church in Boston (66 Marlborough Street) on Sundays at 4pm. The programs, featuring Bach and much more, are an adventurous mix of beloved warhorses and rarely performed masterworks. A big thank you to everyone who attended our first six concerts! For the reviews of the September 23, October 21, and December 16 concerts in the Boston Musical Intelligencer, please visit our Press page. We are looking forward to seeing you at our last concert of the season, on Sunday, May 5 at 4pm, featuring works by Bach, Beethoven, and Brahms. For tickets, please click here. Our next season will be announced soon. Thank you, and see you at Glissando! Artwork: Sergey Schepkin Plays Bach on the Piano by Eugene Saletan. © 2018 Sergey Schepkin. All rights reserved.